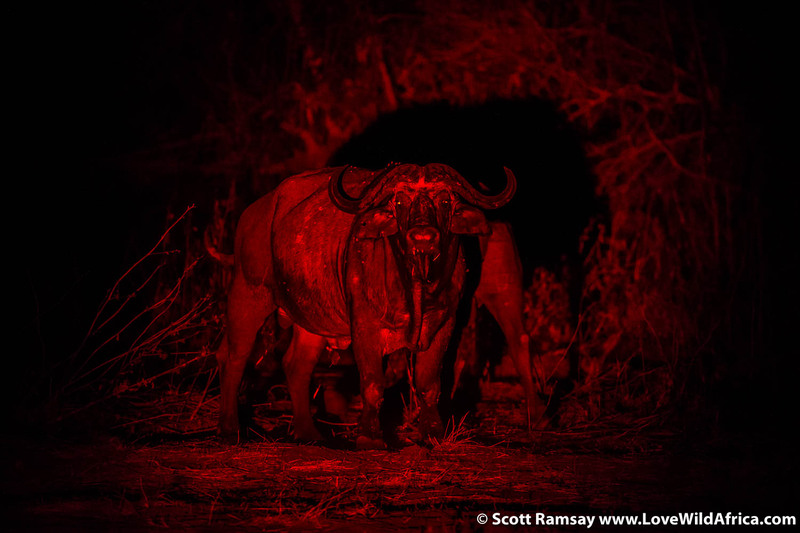 I was taken on a night drive at Little Ruckomechi in Mana Pools while staying there. Honest Siyawareva was my guide, and I was grateful when the sun went down, and temperatures cooled after the hot day. We left late afternoon, and found a spot on the side of the Zambezi River to enjoy a cold beer as the sun dropped behind the hills of Zambia across the river. This was just after we had spotted a leopard (read about it in this blog), and so our spirits were soaring. 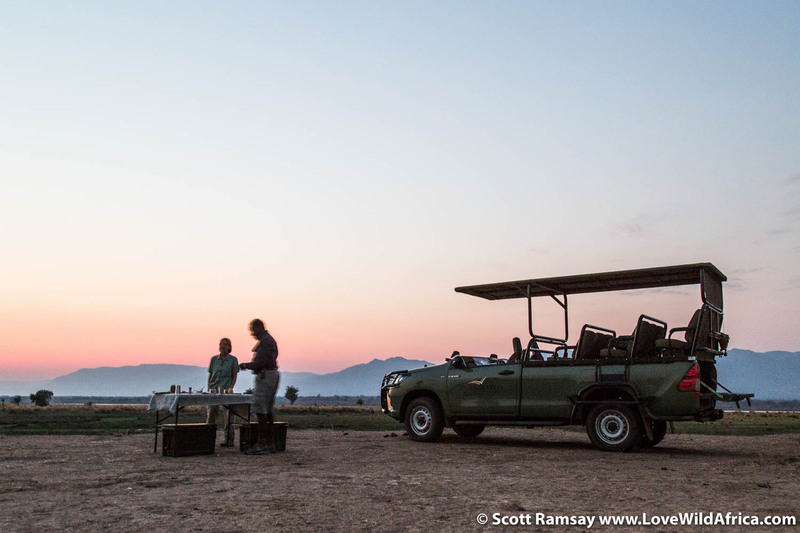 It’s hard to beat the feeling of a cold beer in your hand, watching the sun go down over an African wilderness, having just spent half an hour with a leopard. 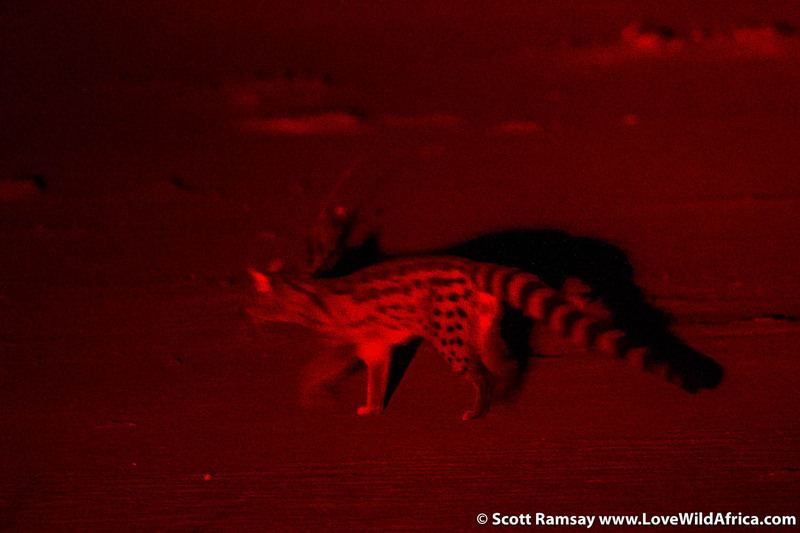 Using the red spot light, we spotted a small-spotted genet (sorry, couldn’t resist). This is definitely one of the prettier small predators. Then, just was we got near to camp, a bull elephant stood in our way. Because the bush was thick, we couldn’t get round him, so we just waited, and waited…and waited. Eventually, he moved off, but there’s no rushing a bull elephant! 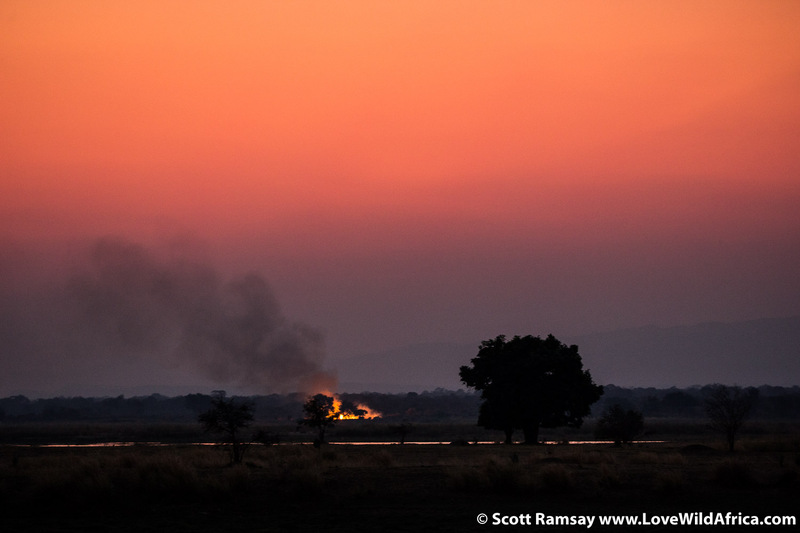 Sundowners on the banks of the Zambezi River. Towards the end of the dry winters, local people on the Zambian side of the Zambezi start burning the grass…to ensure fresh grazing for their cattle when the rains fall, and partly so that the bush is not thick, so they can see where the wild animals are…living among wildlife is not easy for many communities in Africa. 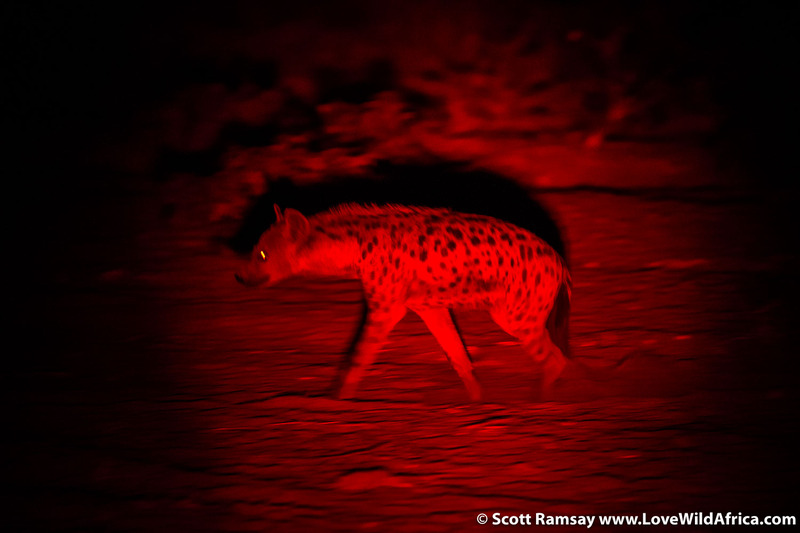 Spotted hyaena on the prowl. I’ve never, ever seen a happy Cape buffalo. They always seem so grumpy, especially the older ones. I would not want to be walking through the bush at night with one of these fellas around. 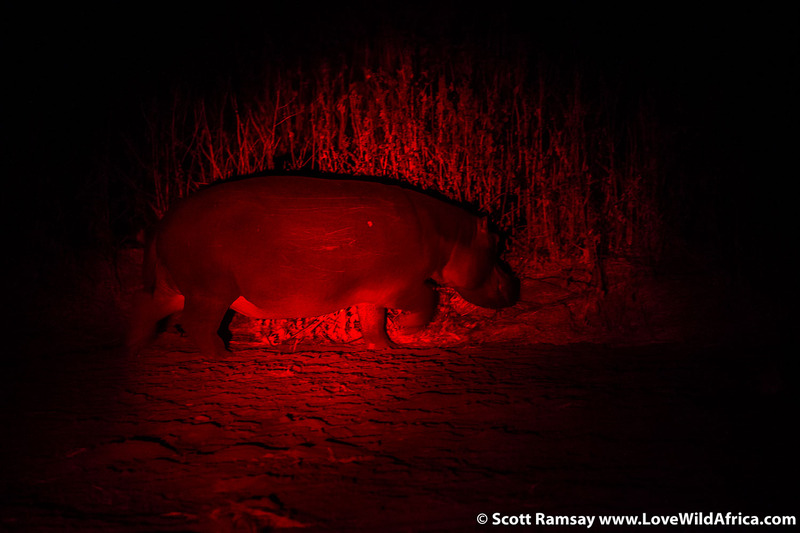 Hippo leaving the river, in search of grazing at night. 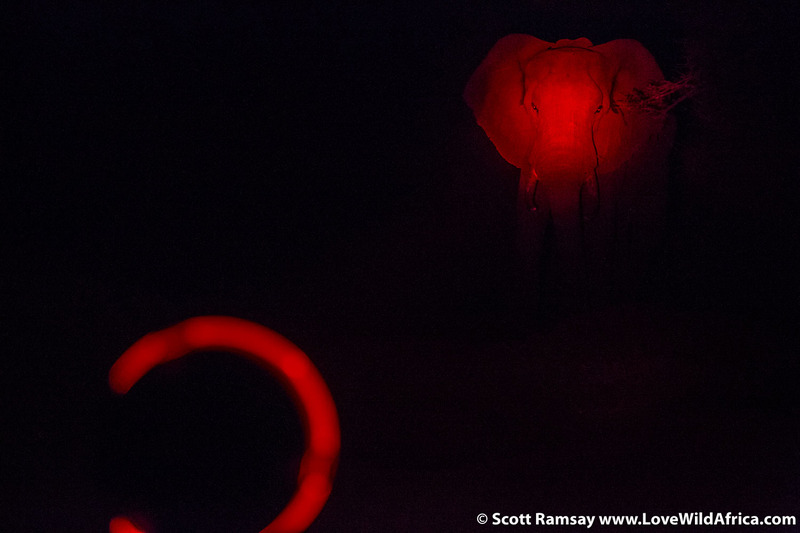 The red light of our vehicle shines on the bull elephant which took his time to let us pass!